For registration inquiries or to book a tour! Purple ‘Potamus Preschool offers a developmental and age appropriate program where children can discover a secret world where play, creative freedom, self trust and personal responsibility opens the child's mind and heart to the excitement of learning and the enjoyment of sharing it with others. We understand and emphasize learning should be fun, therefore, children will be encouraged to learn through play to discover and develop their social, physical, intellectual and emotional skills. We offer yoga sessions to further develop children's flexibility, imagination, focus and concentration, also to expand learning and self confidence. Did you know that developmentally appropriate software engages children in conversation and creative play? 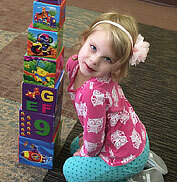 Did you know it also helps develop children’s problem solving abilities? Preschoolers will enjoy independent ability with the computer. They will be able to turn off and on the computer, learn proper usage habits and proceed through several levels of challenge. WHY TEACH YOUR CHILD A SECOND LANGUAGE? Besides developing a lifelong ability to communicate with more people, children may derive other benefits from early language instruction, including improved overall school performance and superior problem-solving skills. Will a Second or Third Language Interfere With My Child's English Speaking Ability? In most cases, learning another language enhances a child's English ability. Children can learn much about English by learning the structure of other languages. Common vocabulary also helps children learn the meaning of new words in English. Experimental studies have shown that no long-term delay in native English language development occurs between children participating in second language classes and those schooled exclusively in English. Our students get the opportunity to experience the feel of using different languages like French and Spanish. Using Sign Language to increase reading abilities has been made it in to the school systems. Sign language is talking with your hands. It helps hearing people like us remember words because the signs illustrate the words. As you sign with your baby now you are creating the basis for a proven method to teach reading and phonics to your preschooler, ensuring a life-long love of reading. 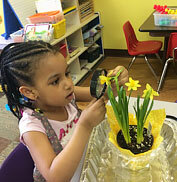 Our Preschool Program offers a rich variety of projects such as Creative arts, Gross motor, Fine motor and Group activities that build upon established foundations for learning while focusing on advance language ability, mathematical reasoning, and scientific thought. 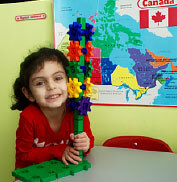 Children develop independently and in small groups. Our learning centers allow limited group sizes and offer guided experiences that encompass all the skills and understanding necessary for optimum development and academic success. Our students are free to choose any centre they wish to play. Our teacher directed group time will introduce different languages and phonics at appropriate times, sing songs with and without music, read or tell oral stories, finger plays, rhyming words and open discussion time. As the new school year begins, parents and teachers of preschoolers have much to think about. Research in recent years has highlighted the importance of early education, and we all want the best for the children we care about. Parents and teachers of four-year-olds might not realize, however, that this is also the perfect time to begin thinking about kindergarten. Many parents and teachers do not start thinking about preparing for the transition to kindergarten until a month or two just before kindergarten begins, because they may not be aware that successful transition to kindergarten is a process that begins the year before. The transition from early education programs to kindergarten can be a stressful time. It is important for our Preschool to have tools and resources that can guide children and families through the process. Tasks that may be second nature to older children, like properly holding a pencil and listening to a story with a group, are some of the vital skills kindergarteners will be expected to know when school begins. 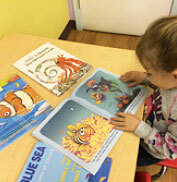 At Purple Potamus we gradually expose children to these types of experiences during the year before kindergarten so your child will become familiar with them. Joining a play group, attending story hour at the local library, and encouraging interaction with new friends are great ways to introduce your child to new social experiences, which will help them do better in school both academically and socially. An additional benefit of preparing early for kindergarten we at Purple Potamus make Report Cards of each child showing which skills the child has or has not mastered. This is valuable information to share with kindergarten teachers. By starting early and learning new skills along the way, your child will have a strong start to the exciting year of learning that lies ahead. We take pride in mentoring Early Childhood Education students from Mount Royal University and Bow Valley College. 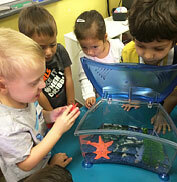 Purple 'Potamus Preschool & Jr. KG have partnered with a team of professionals since the last 3 years. They provide services for preschool children and their families for delay in speech, fine motor skills, English as second language and in many other areas. This is a great opportunity to have your children screened early before they enter school system. Last but not the least, we go one step further and take pride in teaching our students the meaning of charity. Every year we partner with different charity organization. Charity is kind of Love Offering that is done without any obligation. When you are not obliged to do anything, and yet you do it - then, you are being charitable.